Wolverines have a reputation for fierceness. They are willing, or maybe just desperate enough, to take on prey much larger than themselves. Wolverine are about same weight as a medium-sized dog, yet under favourable snow conditions, a wolverine can kill a caribou ten times its size, as happened on Mount Klotz in Mount Revelstoke National Park. 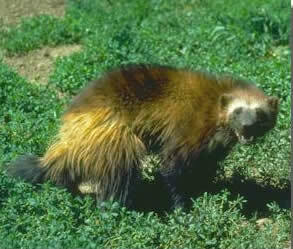 The wolverine is the largest terrestrial member of the weasel family. It lives mostly by scavenging from dead animals. When hunting, they usually kill small mammals such as squirrels, martens, marmots, and porcupines with a bite to the base of the skull, their incisors slipping between the vertebrae to sever the spinal column. Typically, scavengers such as wolverines prosper in the presence of other more effective predators such as wolves, making use of their leftovers. However, wolves are rare in the Columbia Mountains. Instead, avalanches that kill unlucky caribou, moose, or mountain goats are just the sort of good fortune that these wilderness wanderers need. Wolverines have a large foot relative to their size. It is heavily furred, an adaptation for walking on snow. They take a short step, have five toes and leave a print about the size of a man’s fist. When ski touring, I have occasionally come across a lone set of tracks heading over alpine passes as high as 9000 feet. Parks Canada partners with researcher John Krebs, a biologist with the Columbia Basin Fish and Wildlife Compensation Program, who leads the investigation of wolverine population numbers and habitat use in the Selkirk Mountains north of the Trans-Canada Highway. The study area contains ten registered trap lines, two national parks, a major transportation corridor, two hydro-electric reservoirs, active logging areas and supports substantial recreational activity including helicopter skiing, snowmobiling, ski touring and hiking. As such, it is a microcosm of land use in much of British Columbia. Krebs estimates that they are 20 wolverine in the 4000 square kilometer study area. Their distribution shows a strong preference for roadless areas and a disproportionally high use of Mount Revelstoke and Glacier National Parks. His work indicates that adult male wolverines within the study area have home ranges of around 600 square kilometers, whereas sub-adult males roam over as much as 3500 square kilometers in search of a suitable territory. A home range of an animal is the area of land encompassed by its roaming in the course of making a living. More wandering means more food is needed and more risks encountered. In the past five years, two of his study animals have been killed in highway / railway collisions, five have died in traps, and eight have starved or been preyed upon. Female wolverine home ranges are smaller, around 300 square kilometers, about the area of Mount Revelstoke National Park. A typical maternal den site is under large fallen logs or boulders in the subalpine forest. Females that breed have only been found in roadless, undeveloped drainages as they appear to be sensitive to disturbance during the March / April denning season when the kits are born. They seldom have young two years in a row.